Ensure that your workers know that they have three important rights. Across Canada there are laws in place to protect workers on the job. This occupational health and safety legislation gives three important rights to all workers to ensure they have the knowledge they need to be safe on the job and the freedom to participate in health and safety activities in their workplace. These rights include: the right to know; the right to participate; and the right to refuse unsafe work. 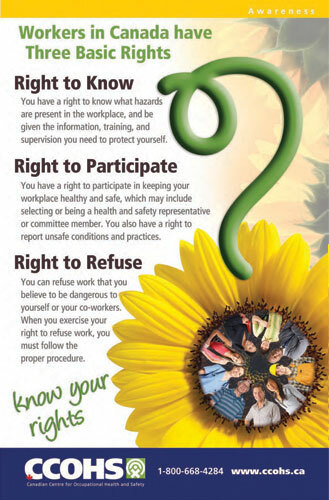 Display this poster throughout your workplace so your employees are aware of their rights that are in place to help them be healthy and safe at work.